Of my favorite teaching strategies is bouncing warm-ups back and forth with students. We echo short phrases in legato and staccato as a form of rhythmic rehab. The recordings of these interactions become valuable practicing aids between lessons. 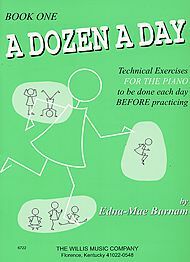 Yesterday, an adult pupil and I had fun sharing E Minor/Major penta-scales and five-finger position thirds from Burnam’s Dozen a Day, Book 1. Rhythmic cohesion and crisp staccato releases were playing goals, reinforced by persistent practice and suggested ways to refine. Both teacher and student gain immensely from these weekly exchanges.